Packaged-food manufacturers that make products like cheese and juice hope to cozy up to colorful and fragrant tomatoes, apples and pumpkins—in some cases fundamentally changing traditional store layouts. The produce section has become the equivalent of the popular kids' school-lunch table. The area is increasingly located near the supermarket entrance, so every shopper passes through it. And stores are finding that consumers consider even packaged foods placed there to be fresher and higher quality—researchers call this a "halo effect." In a Supervalu Inc. survey of consumers in November, 92% of shoppers said fresh produce was the No. 1 factor in choosing a grocery store. (Meat came in second.) Fresh produce is "the first thing people see and really sets the tone for somebody's shopping experience," says Mike Siemienas, a spokesman for Supervalu, the third-largest traditional grocery company in the U.S.
Kraft Foods Inc. has envisioned its ideal setup. In the old way, dairy cases were located at the back of the store, so shoppers would be tempted by other products on their way to buy milk and eggs. In the Kraft vision, the dairy department would be moved to the front, near produce, meat and seafood, says Art Sebastian, director of shopper insights and category development for the company. Research at Kraft, the world's second-largest packaged food company, after Nestle SA, shows that the move, along with other measures, would help "play up the fresh factor, the cooking factor," of its products, he says. At the front of the store, it's easier to inspire shoppers to make impulse purchases or buy multiple products, he adds. At the back, where a typical 20-minute shopping trip ends, the "budget is already spent" and "the kids are screaming," says Mr. Sebastian. About 10% of Meijer Inc. stores, a Midwestern chain that sells both groceries and home goods, have started putting dairy near or at the front of stores, says J.K. Symancyk, executive vice president of merchandising at the company. The store's research shows shoppers increasingly buy dairy products like yogurt and cheese at the same rate they would fresh produce or meat and think of it as a fresh item, so it makes sense to sell dairy earlier in a shopper's visit, says Mr. Symancyk. Still, most grocers aren't eager to bring items other than fresh food into the produce section. "We really want to try to keep the balance between what we would perceive as fresh produce" and dry grocery items or processed food, says Craig Ignatz, vice president of produce and floral at Giant Eagle Inc., a supermarket company with locations throughout the eastern U.S. "There has to be a good reason," like a recent display that put Tostitos Tortilla Chips next to guacamole ingredients like avocados, he says. Since consumers instinctively associate the produce department with health and quality, the makers of V8 vegetable juice, which is usually in a center aisle, are researching the advantages of joining produce. "Shelf-stable juices suffer from being lumped together with sugar water," says Matt Tullman, president and chief executive of Merchant Mechanics, a consumer research firm hired by Campbell Soup Co. to analyze shopping behavior surrounding V8, Campbell's Soup and other brands. But persuading retailers "is a very high hurdle to jump across if you are trying to move from one area to another," says Mr. Tullman. A spokeswoman for Campbell says it isn't actively pursuing V8's move. 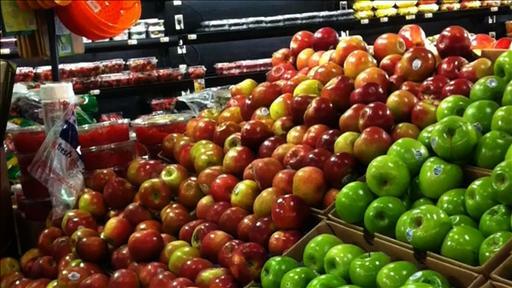 Produce and other fresh departments are becoming more important to traditional grocery stores. Club stores like Costco offer shoppers discounts on bulk products, and gas stations provide a quick option for buying staples like milk. Traditional grocery stores "don't have your entire wallet," says Paul Weitzel, managing partner of Willard Bishop, a grocery-focused consulting company. So supermarkets are working to leverage what makes them stand out, he says. Winn-Dixie Stores Inc., which currently has 482 stores in the U.S., is opening stores with a new layout that aims to highlight fresh produce, meat and prepared food—areas that they say create customer loyalty. The new stores devote an average 30% more floor space to fresh produce versus older stores, says a spokesman. Winn-Dixie's new stores use wood shelves and display tables, evoking a natural image, as opposed to the brand's traditional pink-and-teal color scheme. By mid-2012, a few dozen new stores will have the format. In recent years, Kroger Co., the largest traditional grocer in the U.S., has moved fresh produce to the entrance area of most stores. To ensure shoppers feel "like they are in a garden or an orchard or a farmers' market," the chain is using shorter shelving and taking down signs that would block a shopper's line of sight around the department, says Jeff Burt, Kroger's group vice president for perishables. Some grocery stores are creating mini convenience stores in the front of the store to better compete with retailers like gas stations. Supervalu has plans to place a small refrigerator of milk at the front of its stores after tests at its Jewel-Osco and Albertsons brand stores showed it boosted milk sales. Milk will still be sold in the dairy department. Some lucky non-fruits and vegetables are already mingling with produce. Refrigerated salad dressings make the cut, as do fake meat products like Yves Meatless Hot Dogs. Both are logical purchases with produce items like salad, say grocery stores. POM Wonderful pomegranate juice is feeling the squeeze. The juice is getting less space in the produce section as coconut waters, smoothies and other premium juices take up more shelf, says Kurt Vetter, president of Wonderful Brands sales and merchandising. Recent internal data showed that their most popular products weren't on the shelves of one major retailer for a full week about 20% of the time. Regardless where the dairy case goes, Kraft is working to increase "dwell time" there. Research shows that shoppers in the dairy aisle spend only 10 to 20 seconds in front of cheese. By comparison, people spend around 60 seconds in the household-chemicals aisle to decide which product to buy, says Kraft's Mr. Sebastian. The good news is that dairy has a "very high closing power," he says, as people always buy something.